The Right to food is akin to a fundamental human right, the right to life. Three main elements of the right to food are: availability, adequacy and accessibility of food. All human beings have a right to access to food that is available in sufficient quantity, nutritionally and culturally adequate, physically and economically accessible. This right, however, is still not respected in many regions of the world. In 2015 Università Cattolica del Sacro Cuore organized in collaboration with the Congregation for Catholic Education and the International Federation of Catholic Universities (IFCU) the Colloquium "Right to Food, Peace and Democracy. 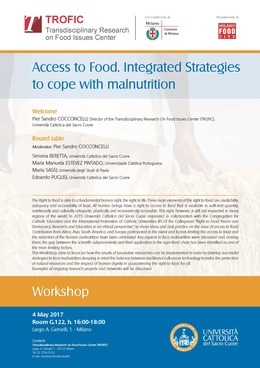 Research and Education in an ethical perspective", to share ideas and best practice on the issue of access to food. Contributors from Africa, Asia, South America, and Europe participated in the event and factors limiting the access to food and the reduction of the human malnutrition have been addressed. Key aspects to face malnutrition were discussed and, among them, the gap between the scientific advancements and their application in the agro-food chain has been identified as one of the main limiting factors.